Our ships came safe home. The Spanish rogues were coming to attack Fowl Mouth, but (as we hoped) the immortal wrath of the Queen Cat of Heaven wrought against them. She would not suffer the rascals near our fowl. 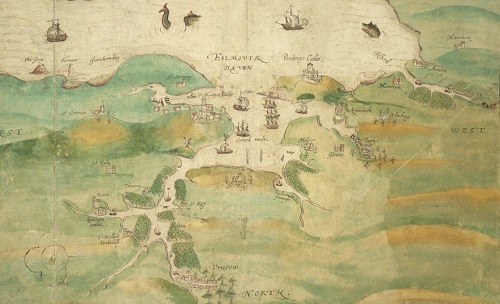 A section from a map of Fowl Mouth (better known as Falmouth, on the coast of Cornwall). Via Wikimedia Commons. Our heroick Essicks has also fled. He went to the country to scape the mortal wrath of Queen Puss [Bess]. The voyage yielded small profit for her, and she blames him for it. But Siffrans Fear [Sir Francis Vere] found her taking the air in her garden at White Hall, and spake so loud in defence of Essicks that many standing by heared all. 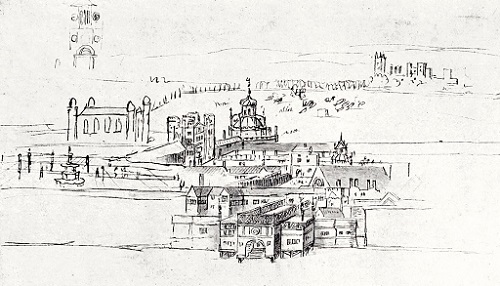 A 16th century sketch of the palace of Whitehall from the Thames, by Antony van den Wyngaerde. Via Wikimedia Commons. I do not know if my lord is condoling with Essicks, or in London. I dare say the Queen’s young Pusses think him heroick. Some here say he sunk one of the King of Spain’s ships. I know not the truth of that. But, in the matter of truth, I reproved my niece for telling the stable cats that Linkin had murdered Nero. She told me her tale. Too tedious to set down here, save that a cat named Lankin sought revenge on one called Miro, who had seemed his friend. Then Lankin nosed Miro’s scents in his mistress’ bed. So he waited in a secret place where none could witness what he did. When Miro came by, Lankin leapt out and seized him by the throat, and made an end to him. Next, Lankin took revenge on his false mistress. He caught a mouse and dropped it by her petticoats. The mouse ran under them. Lankin did the like and, feigning hot pursuit of the mouse, gave his mistress’ legs and bum a mighty clawing. She gave me the look direct. I struck her on her saucie face, and she crept off. Then I made my way to Linkin’s house, for I feared word of her slanders may have reached him. But Linkin had his own tale to tell. He sayt that a friend of Nero’s late master, knowing the Spanish were coming, went to Portsmouth to give what aid he could. When all danger was passed, he lingered there rejoicing. Then (sayt this man) what did he see but a black cat eating a crust in the gutter. This cat was so thin, scabbed, and rusted, he knew him only by his lack of tail. And the man told Linkin’s mistress he believes that when last he went to Portsmouth, poor old Blackie (as he called him) lay hidden on the boat. And slipt ashore, perchance to seek his master, who was then but recently deceased. And he (the man), not knowing Blackie had been aboard, returned without him. This cat now lies at Linkin’s house, where his mistress tends him. Then he’ll go to lodge with the man who found him. “So all’s well that ends well,” sayt I to Linkin. But whene’er Linkin goes to nose him and take what scents might lie beneath the stinks of gutter, this cat swears at him most horrible. Linkin led me to the impostor, who lay resting in a scrap of winter sun. And with my paw turned Fortune’s wheel about. “What mean you by that, you clown?” arrkst Linkin. Certes, he’ll have much to say when he’s made his verses. I hope I may live to hear them, true or false. When I was private in my house again, I counted the winters I’ve seen. I believe this to be my seventeenth. I am of sound mind and in good heart, though my joints ake. I have not lost my personal attractions. 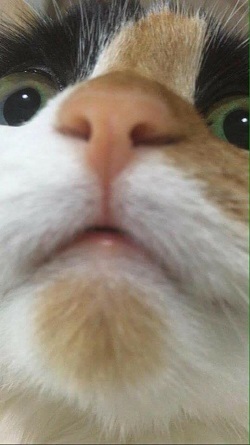 Unlike Queen Puss who has few teeth remaining. Or Nero, who Linkin’s mistress sayt should be new-named Rustie. But sometimes I’m troubled by sharp pains in my loins, the like of which I never felt before. Ask for me in spring, and you may find me a grave cat. The Spanish hadn’t mustered the 30,000 men King Philip of Spain deemed necessary for an invasion, but they hoped to use Falmouth Harbour as a base from which to destroy the English navy. The Earl of Essex, having little to show for his voyage, withdrew to his house at Wanstead. A bad move, because it gave his enemies at Court a chance to work against him. Sir Francis Vere seems to have been an honourable man. He left a brief and business-like account of the Islands Voyage in his Commentaries, where he mentions his argument with the Queen. Despite his annoyance with Essex over the level of command he was given, he didn’t want to see him unfairly blamed for the failure. Gib’s niece has a lighter taste in her reading than her uncle does. The ‘mouse under the petticoats’ incident is a steal from Beware the Cat.